Four inmates at Valley State Prison for Women (VSPW) successfully passed the State Board of Barbering and Cosmetology licensing examination June 21. 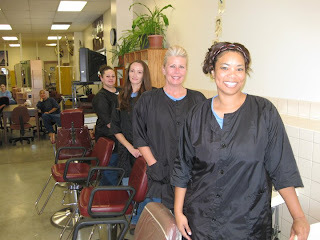 All are now licensed by the state as cosmetologists. With their addition, VSPW has produced seven licensed cosmetologists through the vocational cosmetology class. One of the inmates, with four children between the ages of 8 and 15, is scheduled to be released this year. “This will change my life forever because I can now take care of my children,” she said. Walter Miller, acting Warden, expressed pride in the effort the four female offenders had put forth.